Normally I’m hesitant to buy crab in cans, but for some reason, the Trader Joe’s brand is surprisingly good—and an excellent way to enjoy crab inexpensively. This brightly-flavored risotto is hearty enough to be a main course, but would also work nicely as a side dish alongside other seafood items—like grilled salmon or swordfish. Heat the olive oil in a large pot over medium-high heat. Add garlic and onions and cook until translucent. Add the Arborio rice and cook, stirring constantly until lightly toasted. Slowly stir in stock little by little until fully absorbed (this will take several minutes). If needed, add a little water to create a creamy consistency. 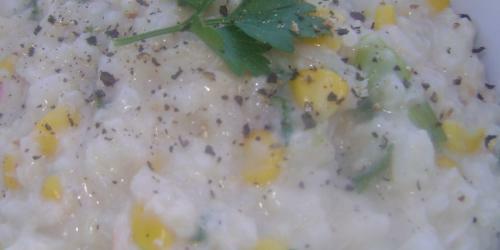 Stir in corn, crab, scallions and most of the parsley (reserve a little for garnish). Season with salt and pepper to taste. Just before serving, stir in the half-and-half and the goat cheese. To serve, spoon into bowls and top with a little parsley. So, the TJ’s crab is good, huh? And they sell it in small-ish cans? I’m impressed. I added about a cup of inexpensive Chardonnay (1/4 of a $3.99 bottle at Trader Joe’s, so $1) to the rice before adding the stock, and substituted 1/2 of a bag of TJ’s frozen asparagus spears for the corn. Awesome lunch. The interesting thing is that this kind of the recipe people most like it and they can do everything for this recipe. The effort that you did for this recipe is so interesting and you should share some more post like this. Your hard work is appreciable for me.